Knit Up & Dye Podcast, Yarn & Knitting Patterns: Crazy People Can like Crazy Day! 1. Double recipe of Carrot Pickles (pg 34, Ball Blue Book), made 7 pints, recipe follows. Used 6# fresh picked Green Bin Farm carrots! 2. 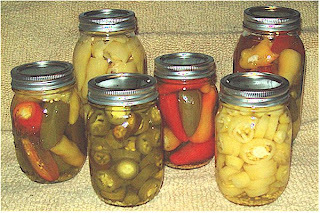 Double recipe Pickled Hot Peppers (pg 318, Complete Book of Home Canning), made 2 qts and 5 pints, recipe follows with modifications. 3. 1 ½ recipe Green Hell (see September 25, 2009), made 1 qt and 5 pints plus 1/3 pint fridge jar. Took approx. 7 hours with breaks. Wash, drain and peel carrots. Large julienne cut carrots, steam until just tender. Combine vinegar, water, sugar and salt. Tie remaining spices in spice bag, add to vinegar mixture. Boil 5 to 8 minutes. 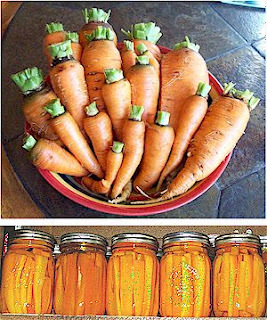 Pack carrots into hot jars, leaving ¼” head space. Remove spice bag. Bring liquid to a boil. Pour over carrots leaving ¼” head space. Remove air bubbles. Adjust caps. Process pints and quarts 40 minutes (Rio Rancho altitude) in hot water bath canner. Makes 7 pints. Combine vinegar, water and garlic. Bring to boil over medium-high heat. Reduce heat and boil gently for 5 minutes, until garlic flavor has infused. Discard garlic. Pack peppers in jars, either whole with slit through, or ½” sliced rings, adding roasted garlic clove, leaving ½” plus head space. Ladle hot liquid into jar, covering peppers, leaving ½” head space, air removed. Process for 20 minutes (Rio Rancho altitude) in hot water bath canner. Makes 2 qts and 5 pints.